Walking on water or at least across water. The Dam Walk bridge is starting to take shape and the city has posted progress pictures here one of which is below from January 6th. Among the planned improvements to the existing structure is an expansion of the “Three Days in April” overlook, which memorializes a significant point in Richmond’s history when- during three days in April 1865 – the city fell to the Union Army after four years of civil war. In addition, three new overlooks with interpretive content will be added to the bridge as part of the redevelopment project. There has been progress and work is set to begin but according to the RTD that work will have to talk a slower pace due to residents of the river and bureaucracy. The original plan was to have the project finished in time for this September’s World Cycling Championship but that is looking unlikely. The first and supposedly main reason for the delays is this rather vague statement, “Tammy D. Hawley, press secretary to Mayor Dwight C. Jones, said the main issue is a “lack of response” to the city’s original request for proposals on the $8 million project”. The other reasons make much more sense and over concerns for the annual run of shad and the return of sturgeon that limit work taking place in the river between February 15th and June 30th. RTD ran a story that, while didn’t present anything dramatically different, is good for some quality quotes from those close to the project. Max Hepp-Buchanan, director of the Sports Backers’ Bike Walk RVA program, said the bridge is an important piece of an improved downtown bicycling network. Nearly everyone I know has dreamed of or talked about walking across the James on the path that appears so tantalizing close to being done. 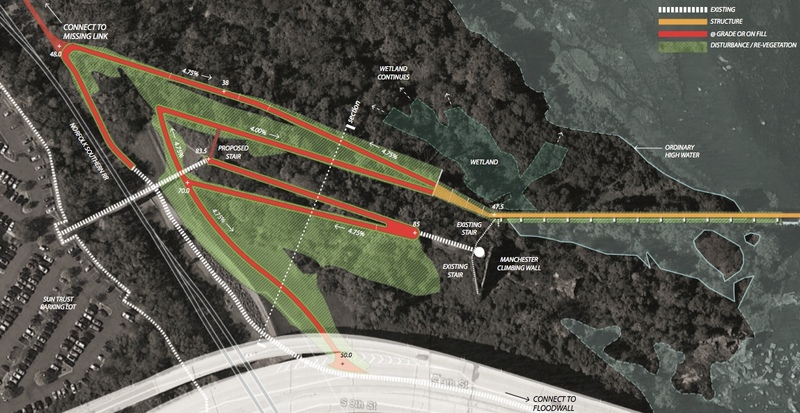 The city has unveiled the plans for the Brown’s Island Dam Walk (PDF) which is one of the first steps in the Richmond Riverfront Plan. The bridge would connect Manchester to Brown’s Island. At 10 feet wide it would be able to simultaneously accommodate pedestrians and cyclists–the assumption being that both parties are paying attention. The walkway would include at least four overlooks that will quickly become the best and most photographed views in RVA. There is one bump in the road to bridge Nirvana however and that’s the Manchester side. There are wetlands that are protected in the area, and there is the danger of flooding. To deal with those issues there are two paths, the high and the low. The high option seen above will require considerable removal of vegetation (the green) and fill (the red). This is the city’s preferred route. The low option doesn’t require as much backfill and it also will force users on a more round about route if trying to get onto the Manchester Bridge. The Richmond Department of Planning & Review is holding a meeting onTuesday, January 21 at 7 p.m. at the Virginia War Memorial Auditorium, (621 S. Belvidere Street), to discuss this and the Chapel Island Trail. The meeting will open with a concise overview of the Riverfront Plan. The firm leading the design of both projects will make a presentation of the schematic designs at the beginning and then open the floor for questions and comments from attendees.